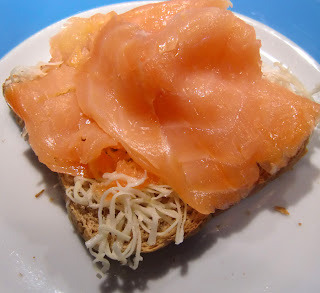 For several months now, I've been really craving smoked salmon on fresh white bread (or, alternatively wholegrain toast) with a tiny bit of butter and lots of grated horseradish. Some drops of freshly squeezed lemon juice on top of the salmon are the finishing touches. I probably could eat this every single day, but actually only buy smoked salmon every other week or so as I do believe in a varied diet. Sometimes I think back wistfully to my "rucola days", though.